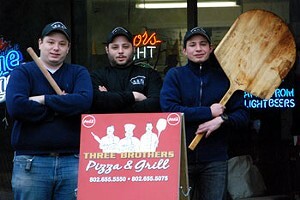 Three Brothers Pizza & Grill is a family-owned and run restaurant located in Colchester, VT off of exit 16. We have a wide-ranging, delicious menu inspired by all three brothers and their close friends. We use great local Vermont products and vendors such as Cabot Cheddar, Ben & Jerry's, Shadow Cross Farms and others. There's a big difference between "Big Chain" pizza restaurants and independent pizzerias. Come in and taste that difference! Pulled pork and spicy Thai pies pair perfectly with pitchers of Switchback at this family-owned pizzeria, which emphasizes local products.